At Computex a couple of weeks ago, Intel announced its new Basin Falls platform, consisting of the X299 chipset with motherboards based on it, a pair of Kaby Lake-X processors, and a set of Skylake-X processors going all the way up to eighteen cores, denoting the first use of Intel’s enterprise level high core-count silicon in a consumer product. For the most part, we had assumed that the news was just that, and following traditional Intel strategy they would not officially give a launch date until the reviews go live sometime later. So imagine our surprise when Intel starts announcing dates at the E3 show this week. The two quad-core parts are part of the Kaby Lake-X family, essentially using the mainstream Kaby Lake-S silicon but disabling the integrated graphics and expanding the voltage/frequency window and TDP limit to give extra frequency. As already demonstrated, extreme overclockers have hit over 7.5 GHz on these chips at a special Computex Intel event using Liquid Helium, with positive words coming out about 24/7 overclocking capabilities on air and water. 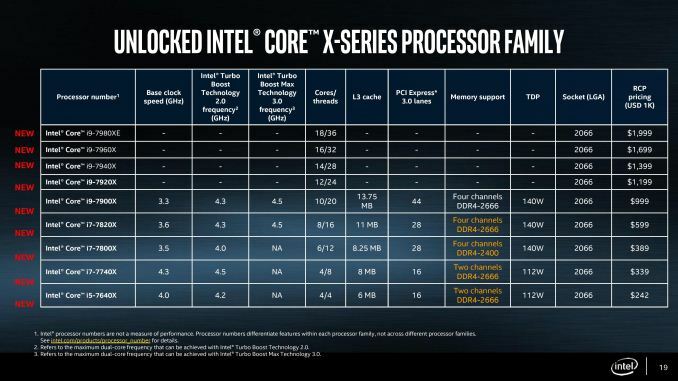 The other three parts are the Skylake-X family, with the 6, 8 and 10-core variants all coming from the same harvested low-core-count die. The big upswing for these processors is the rearranged cache arrangement, with Intel moving from 256KB of L2 cache on the previous generation to 1MB of L2 cache on Skylake-X (and changing the L3 cache from being a fully inclusive cache to being a non-inclusive cache). This significantly enhances software which is L2 cache size sensitive, although it remains to be seen how much of an effect it will have for consumers. For the other parts, 12 core and up, Intel is staggering their launch to the extent that we do not even know many of the details. Intel's own documents list them all as TBD for frequency, power and DRAM support – the only certainties are core counts, pricing, and the fact that they will use the same socket as the above five processors. The August shipping date for the 12-core will be interesting, given that Dell has announced that pre-orders for its ThreadRipper Alienware desktops start on July 27th. The same announcement from Dell states 'and the Area 51 featuring Intel Core X-Series will arrive on August 22nd, and the product page states that this includes the 12-core option, as well as 6-10 cores. Whether the wording 'arrive' means pre-order or release we do not know, although the TR version explicitly states 'pre-order'. Ryan points out that this could just mean the 6-10 core options, as it doesn't explicitly state the 12 core and Intel hasn't made a firm date themselves yet.